South Korea is an unrivalled first mover in the wireless evolution to the fifth-generation, according to a global management consultancy. 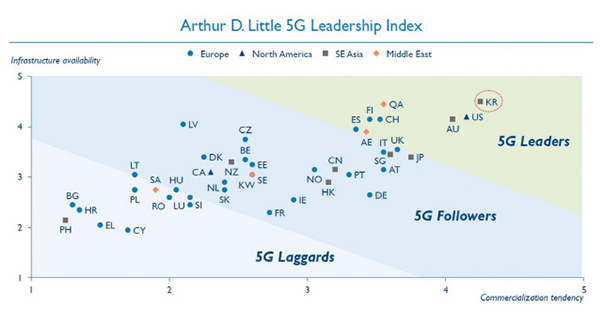 Arthur D. Little (ADL), the Boston-based consulting firm, ranked Korea as the most advanced in its 5G Country Leadership Index. The study rated 40 countries based on their infrastructure availability and commercialization tendency. Some of the factors behind infrastructure availability were 5G spectrum allocations, willingness of deployment and capex by mobile carriers. To assess commercialization tendency, components like the success rate of 5G demonstration, fiber-optic household coverage and household consumption levels were taken into account. ADL said Korea used the Pyeongchang Winter Olympics in February 2018 to ensure 5G leadership by becoming the first in the world to set up a full 5G network and demonstrate various services. This experience has enabled KT and other local carriers to move faster and bolder in deploying the networks that are critical for the spread of artificial intelligence, autonomous vehicles and other cutting-edge technologies. Following Korea, the United States and Australia received high marks in terms of 5G allotment, high-performance backhaul infrastructure and rollout readiness. Other countries grouped as 5G leaders were Qatar, Switzerland, Finland, Spain and the United Arab Emirates. ADL pointed out that the six Arab states of the Gulf Cooperation Council, including Saudi Arabia, Qatar and the UAE, were also ahead in 5G services while Europe lagged overall due to the region’s heterogeneous infrastructure and fragmentation.